Ed Herbst writes: The first issue of Piscator was published in 1947 and, in the ensuing 65 years, it has provided an important historic overview of how indigenous patterns evolved. Although no longer relevant, I would argue that Fred Bowker’s Mountain Swallow was the first Western Cape fly design that was created with specific intent. Bowker arrived in Cape Town from England in 1902 and a year later was fishing the Eerste River in Stellenbosch. He wrote two books, A Trout Fisher in South Africa (1922) and Trout Flies (1938) and it was in the latter that he described a fly of his own design, the Mountain Swallow. 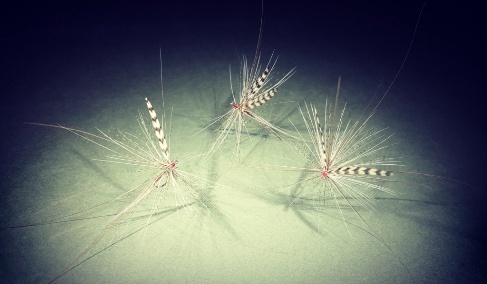 Bowker fished down and across, initially with salmon flies such as the Durham Ranger and Silver Wilkinson in the largest permitted size, about a current #10. Fast forward to the mid-1960s and Mark MacKereth, a professional musician from Yorkshire in England arrives in Cape Town and changes the routine of fishing for trout in streams forever. 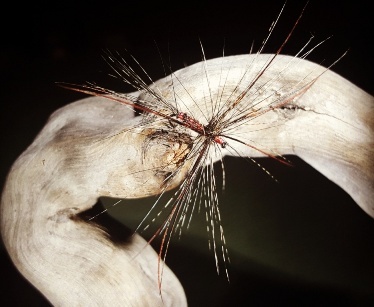 His Caribou Spider was the first local fly to use the spun and clipped deer hair technique and he tied it to imitate the Lycosid Wolf spiders. They do not build webs but hunt on stream banks which makes them vulnerable to trout. One of his protégés, Tony Biggs, developed the RAB in 1965 and in 1987 Dean Riphagen developed his G&B Low Floater specifically for the brown trout on the Witte. In the past decade, competition fly fishing has been the catalyst for a lot of innovative thinking among a new generation of anglers and the patterns of CPS members like MC Coetzer, Stanton Hector, Maddy Rich and others can be found on Tom Sutcliffe’s Spirit of Fly Fishing website. The Feathers & Fluoro website also contains valuable articles on the evolution of flies developed in the Western Cape for a variety of fish from carp to kob. This Patterns from Piscator folder will, with the help of our secretary Louis de Jager and Sunet Terblanche who will post the articles from Piscator that he scans, reflect our fly tying journey over the past six decades. Below are various articles on fly patterns published in Piscator over the years.